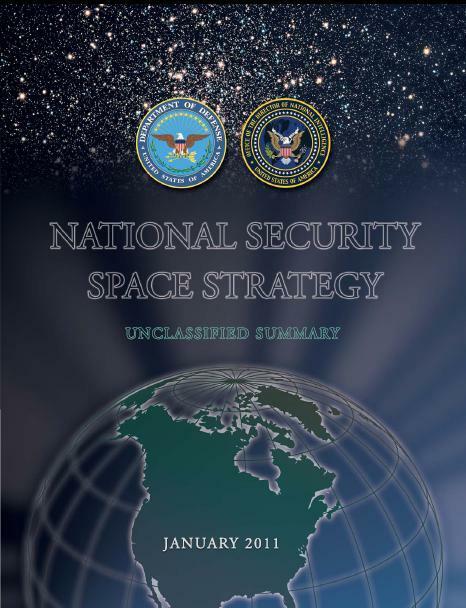 The National Security Space Strategy—At Last! One of the most striking things about the new National Security Space Strategy (NSSS) that was released on Friday is the number of times some version of the word “responsible” appears in it—more than 20 by my count. This was clearly a key concept behind the thinking that went into the Strategy. And, while “responsible” behavior is only defined implicitly in the document, this may be a useful way of characterizing those using space since it distinguishes them by their actions and doesn’t a priori pigeonhole them. Of course, the next step is for the U.S. to work with other spacefaring countries to reach some agreement on what “responsible” means. I expect there is a lot of common ground on what constitutes responsible and irresponsible behaviors in space, but I also expect there are going to be some important grey areas that need to be discussed. While the European Code of Conduct may be a useful step in that direction, it has the important drawback that some of the key players in space, like China, were not at the table when the Code was developed. We will consider proposals and concepts for arms control measures if they are equitable, effectively verifiable, and enhance the national security of the United States and its allies. … the focus of the administration really is on promoting what we like to call transparency and confidence-building measures, which tend to be voluntary as opposed to legally binding. We believe setting pragmatic guidelines for safe activity in space can help avoid collisions and other debris-producing events, reduce radiofrequency interference, and promote security and stability in the space domain – all of which are in the interests of all nations. This raises the question of who is setting the guidelines and whether they will be the result of international discussions. Multilateral discussions are not only likely to come up with a better set of guidelines, but are likely to increase the commitment of the countries who were involved in drafting them. A third level of deterrence is being able to continue to operate despite attacks… so that a country sees less value in attacking our space assets. And then finally, we retain the option … to respond in self-defense to attacks on space. And the response may not be in space either. At the end of the day, the Department, though, is about preserving the space capabilities that enable the superiority of our military forces. And so we need to ensure that we can continue to utilize space to navigate with accuracy, to communicate with certainty, to strike with precision and to see the battlefield with clarity. Those are those core military capabilities and that’s at the core of this strategy. In addition, Lynn noted, for example, that the document does not specifically address the issue of space weapons. It is crucial that the U.S. set clear limits on military issues like this, and developing these limits should be a high priority next step. Moreover, it is important that the U.S. communicate them to other countries as part of establishing international norms of accepted behavior. The emphasis in the Strategy of structuring U.S. capabilities to be able to weather attacks means that the U.S. can promote such norms without being highly vulnerable to violations of the norms. Amb. Schulte also clarified something we have wondered about: is this document a step on the way to the Space Posture Review that Congress mandated, and would the Review contain more details? But the NSSS document is apparently going to take the place of the Space Posture Review, so fleshing out the details will happen outside of a posture review. Our objectives are to improve safety, stability, and security in space; to maintain and enhance the strategic national security advantages afforded to the United States by space; and to energize the space industrial base that supports U.S. national security. Achieving these objectives will mean not only that our military and intelligence communities can continue to use space for national security purposes, but that a community of nations is working toward creating a sustainable and peaceful space environment to benefit the world for years to come. The devil, of course, is in the details and in operationalizing the approach. Hopefully, this signals that the administration has now formulated a consensus approach and is planning to push forward with a less timid international approach than we have seen so far. UCS’ report “Securing the Skies” gives our proposal for next steps the administration can take in space.